Whether September 29th was the date Mill read this work while studying with his father, or whether its significance lies elsewhere is difficult to determine. Even more unclear is the significance of the number that follows, which cannot correspond to one of the only slightly more than 400 pages in the volume. 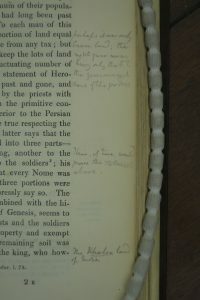 Moreover, there are no marks or annotations on p. 705 of any other edition of Aristotle’s work held in Somerville’s Mill Library. 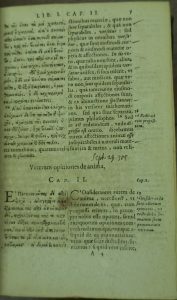 And every one of the date and number pairings in the bilingual Aristotelis de Anima Libri Tres adheres to this format and includes a similarly large number. Note the spelling of Mill’s middle name. Hardly a strategy for endearing oneself to a reviewer, even when accompanied by “faithful regard and friendship,” but Mill seems not to have let it bother him. He didn’t even note the mistake in an annotation.